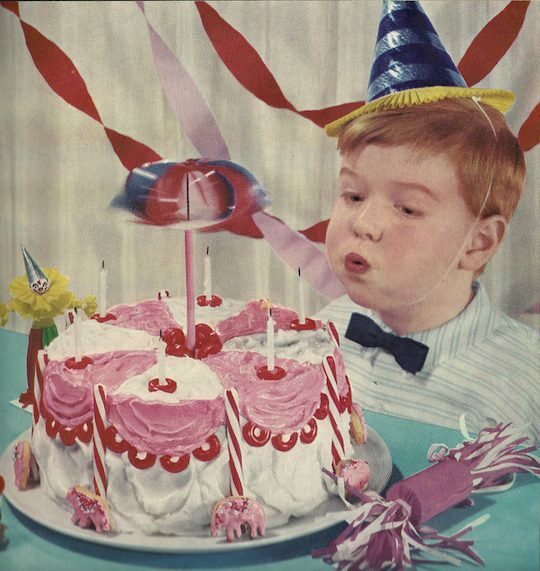 The Betty Crocker Picture Cookbook (buy it ) was released by General Mills in 1950, although a facsimile edition is now available. 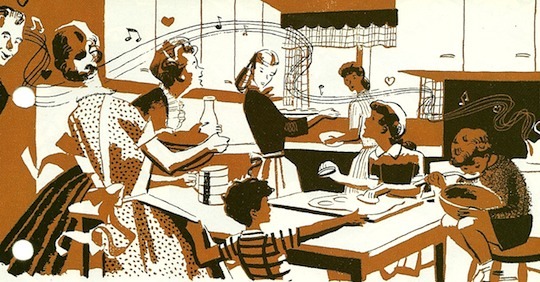 The illustrations here largely depict domestic scenes, as cookbooks during this period often gave household pointers and kitchen design tips in addition to recipes. The photographs are mostly of the food itself. 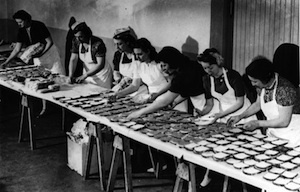 The perfect housewife preparing cookies for what looks like half the neighborhood. Kitchen design tips combine illustrations and photography. 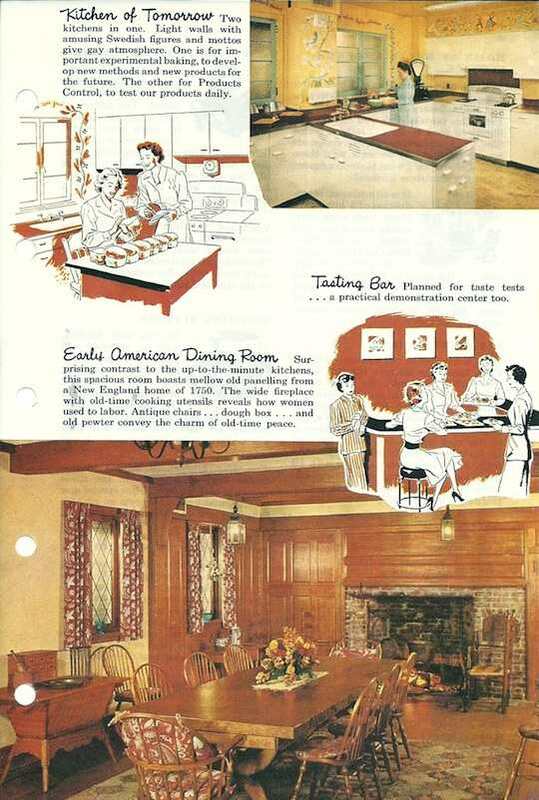 Bonus: a Kitchen of the Future! 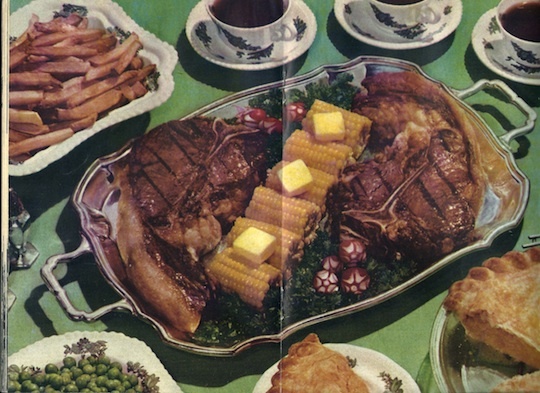 Mid-century food was not necessarily the healthiest, and the meat photography often glistens to prove it. Learning proper knife skills will help housewives maintain their exquisite manicures. 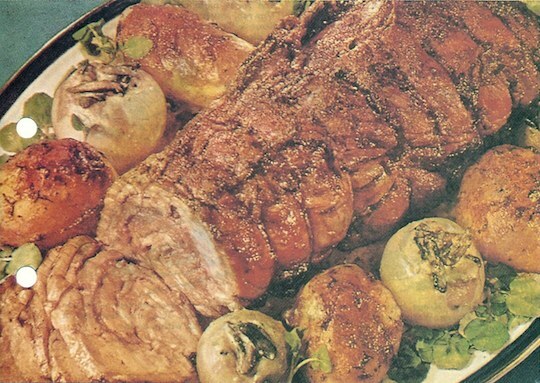 Fast forward to the other end of the decade with The General Foods Kitchens Cookbook (buy it ), and photography has largely replaced illustrations, although there are some drawings illustrating the recipe pages. The domestic scenes here somehow look more staged that the illustrated ones above, and the food itself looks plastic. 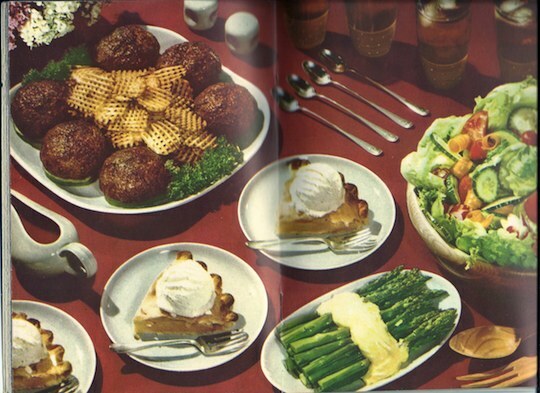 Food styling during this era tended to be overdone: plates look forced and over-garnished, and there tend to be more than one dish per picture, often to the point of crowding. In the picture above, the pie has not only been cut into, but there are crumbs visible; this goes against the general trend towards perfect, untouched, buffet-style spreads. It is often hard to tell whether the graphics are illustrations or overly-manipulated photographs. 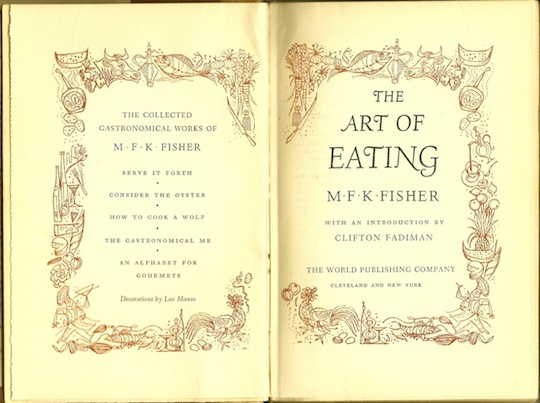 From The Art of Eating by M.F.K. Fisher, 1954. Scan: Eat Me Daily. Book design was generally in two or three colors, with large blocks of color and line drawings of food. The drawings tend to be of ingredients rather than whole dishes, and are grouped by recipe. Often, ingredients are anthropomorphized, like the fish on the book cover below. 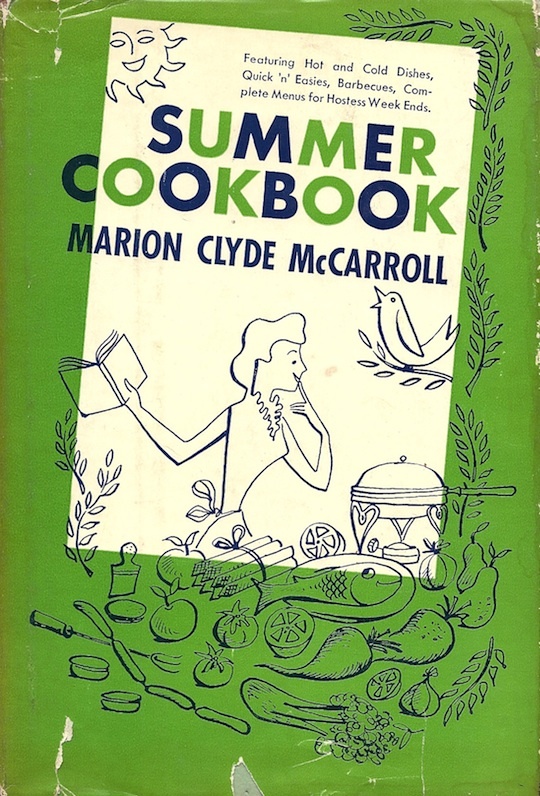 From: Summer Cookbook by Marion Clyde McCarroll, 1954. Scan: Eat Me Daily. We need to bring back the kids-wearing-bowties trend. 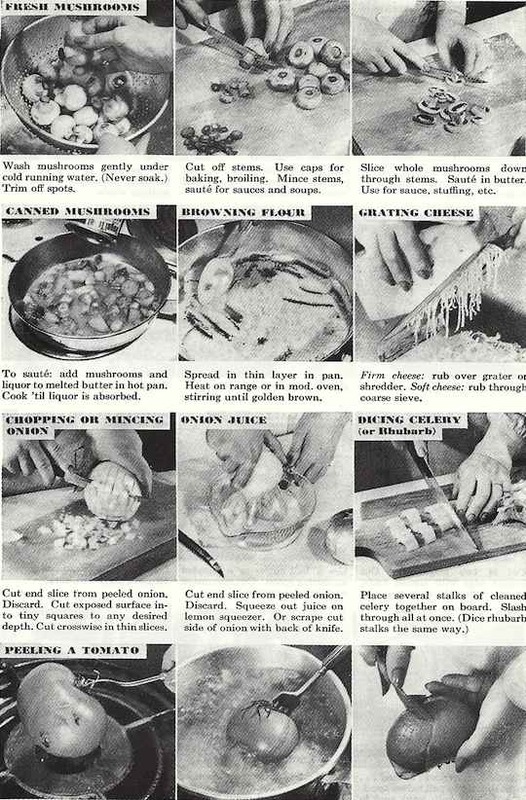 The pictures are like the recipes...old, outdated but interesting to observe. 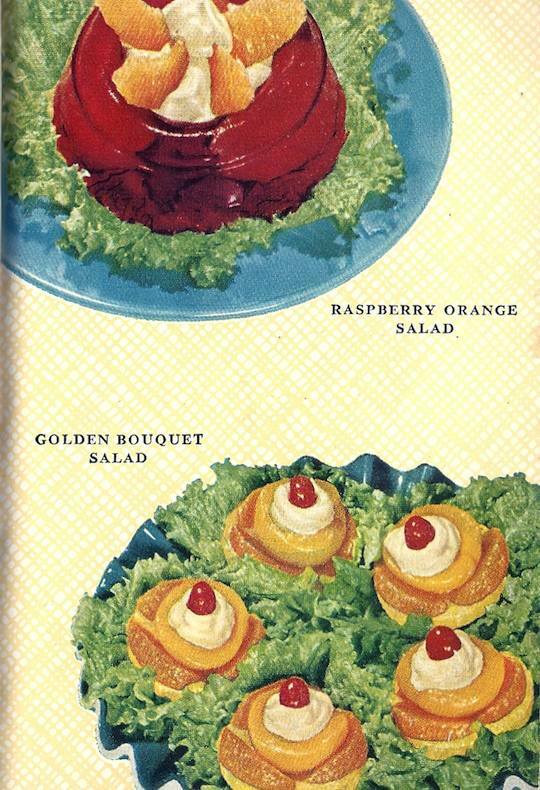 Thank goodness aspic never really stayed around much after that era! 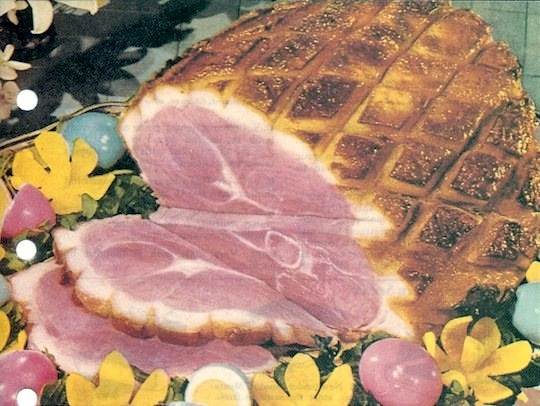 For an in-depth exploration of these post-war cookbooks, I recommend James Lileks' Gallery of Regrettable Food and Gastroanomalies. 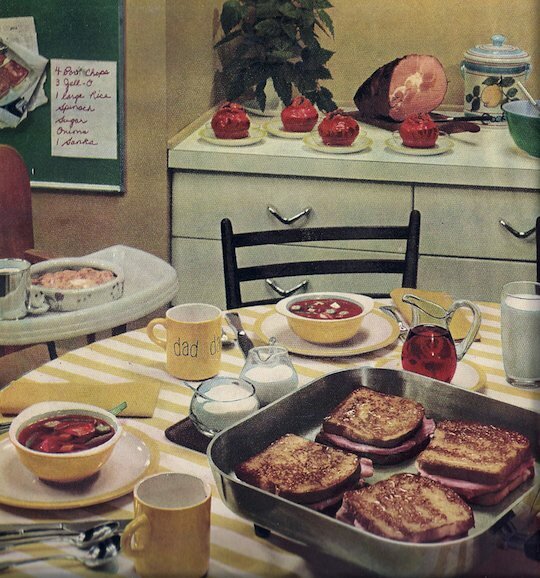 i simply must know, are those french toast ham sandwiches in the first General Foods Kitchens photo?? also, i've been reading your blog for the last 2 hours.